Scottish Parliament bosses have defended a decision not to release details of a Legionnaires' disease scare seven months ago. Bacteria which can cause the disease was found in the building's water supply, it has now emerged. But Holyrood bosses said there was "no risk" to anyone, and the contaminated source was immediately isolated following tests in June 2008. They said the incident had been "taken as a lesson for the future". 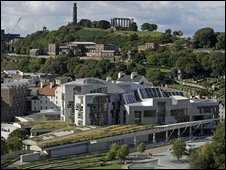 The bacteria was discovered in two "seldom used" water outlets and traced back to a hot water tank inside 17th-century Queensberry House, which forms part of the Holyrood complex. A Scottish Parliament spokesman admitted members of Holyrood's management group, the Scottish Parliamentary Corporate Body, expressed disappointment not to have been told about the find at the time. But Tory MSP Alex Johnstone, who sits on the group, said: "I'm happy it was dealt with at the time. It's been taken as a lesson for the future. "I'd be surprised if anything like this happened again." The bacteria - which can be found naturally in hot and cold water - can lead to flu-like symptoms, fever and pneumonia, if inhaled through vapour. The parliament spokesman said the findings were not revealed to MSPs because the risk was "not considered critical". "We are fully satisfied the measures taken ensured the risk to building users was controllable at all times," the spokesman added.